Superb thinking and outstanding academic performance are closer than they appear. We all have excellent thinking potential, but our thoughts come in fragments, not in full sentences. A large body of research suggests that visual cues are the most effective means of learning because much of our sensory cortex processes images, not words. The metacognitive tools below combine spacial cues, color tones, and cognitive science features to enhance students thinking, learning and performance. In-class educators can unlock students’ critical thinking skills; learning assistance professionals can provide learners the cognitive infrastructure they need to work productively in cognitively complex environments; parents can equip their students with the cognitive skills necessary to excel in scholarship and the knowledge economy, and do-it-yourself students can use these tools to maximize performance and develop as confident, independent learners. Immediately obtain your free PDF of each diagram using the form below. CREATE CRITICAL THINKERS. CULTIVATE ACADEMIC CRAFTSMANSHIP. EQUIP FOR SCHOLARSHIP. Students are measured by their academic craftsmanship. 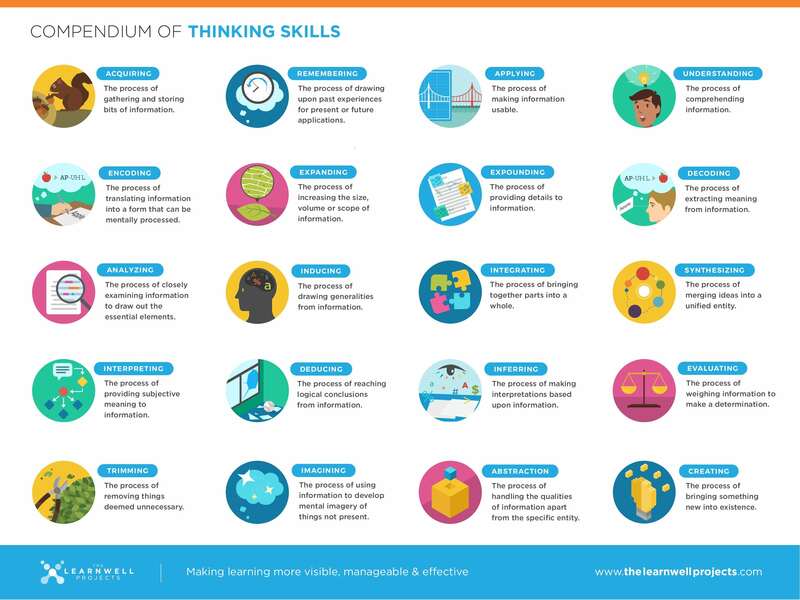 Whether taking a test, writing a paper, solving problems or conducting research, students must activate the proper mix of thinking skills for each respective task. Learning is stimulating and rewarding when students use the right skills. When they don’t, students and educators become frustrated. The Compendium of Thinking Skills is a newly released academic tool that enables students to deliver excellent academic craftsmanship. It empowers educators to powerfully communicate their tasks while positioning students to deliberately select, monitor and evaluate the quality of their thinking. No more sub-standard work! Create complementary learning environments with this new innovative tool. THINK WELL. LEARN WELL. PERFORM WELL. This tool is a knowledge converter. Use it to activate the hidden drivers of students’ thinking and smooth the path from hard work to high performance. SHARPEN MENTAL METRICS. UNLOCK UNLIMITED POTENTIAL. TRANSFORM STUDENT THINKING. Studying is not an exact science. Students struggle to determine whether their study efforts are “good enough” for their tests and tasks. Sometimes they’re right. Many times they’re wrong. 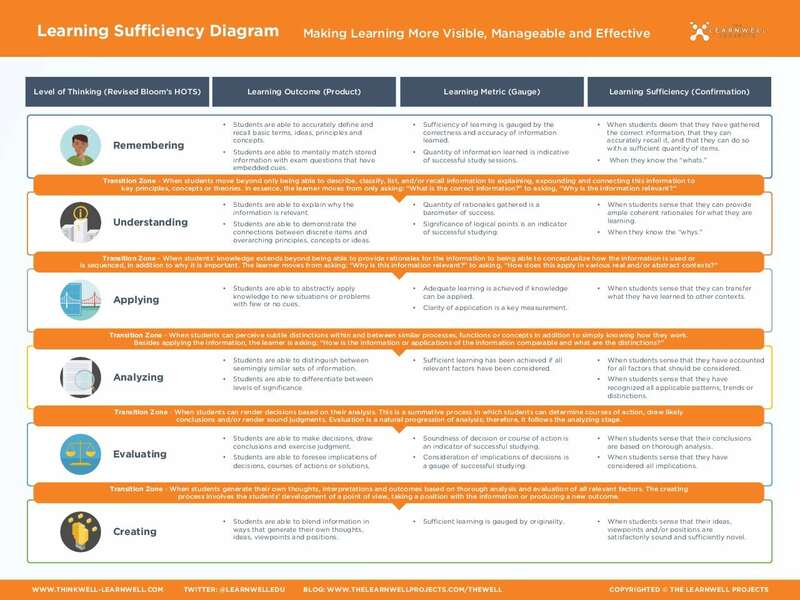 The Learning Sufficiency Diagram provides access to the internal network of metrics and confirmation signals that students unknowingly seek to satisfy at each level of learning. The special Transition Zones serve as mental guardrails that prevent students from getting stuck and ushers them forward as they progress toward more profound, more complex modes of thinking. Whether the task is writing, reading comprehension or math, this tool makes academic success more attainable and much more enjoyable. How did you hear about The Learn Well Projects? 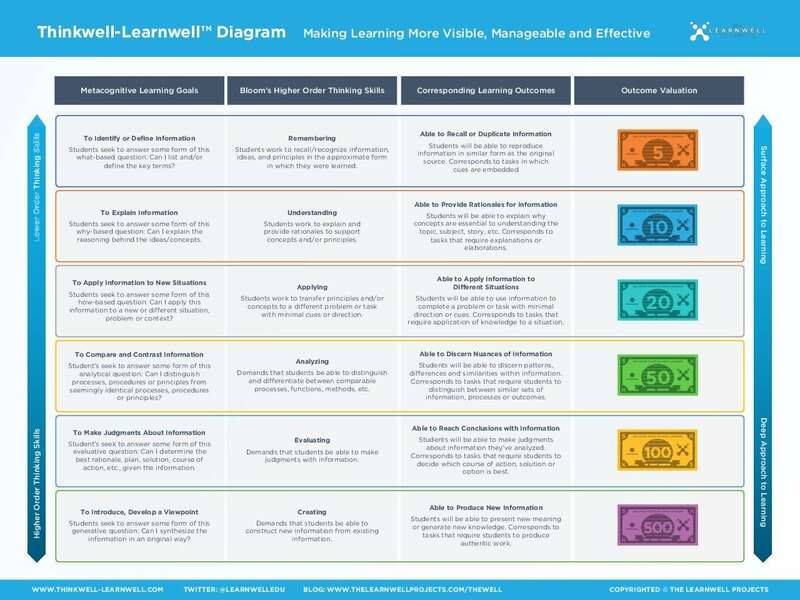 The LearnWell Projects helps make learning more visible, manageable and effective for educators and students. Our brand is to provide educational materials that are fresh, authentic, proven, and applicable.